The edge on a Kasumi knife is beveled like a western style knife. However, the bevel is much larger than the bevel on a European or American brand. This larger bevel creates a sharper edge. Kasumi knives do not have a bolster. 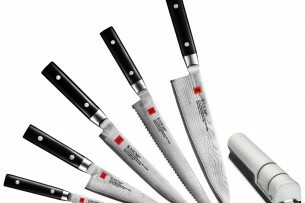 They do have a stainless steel ferrule that is forge welded to the blade to ensure that food particles do not become trapped between the blade and the handle. They also have a full tang. The handle is made from multiple layers of wood impregnated with a plastic resin. The handle is riveted to the tang.